I’m learning that wagons are extremely hard to draw–straight lines and boxes aren’t my strong suit. Though, the hardest part is the wheel. I have an embarrassingly hard time drawing wheels. I must find them boring, and therefore feel no motivation to practice so it isn’t a monster fight every time I try to draw a wagon. 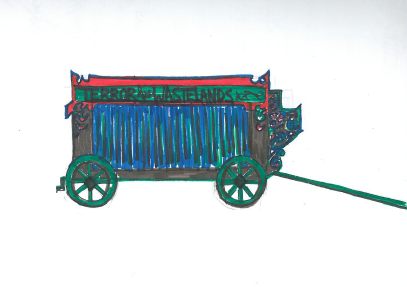 I should probably work a bit harder at that–because Fang and Seyba’s wagon was really cool looking in my head.